The Supreme Court today issued a notice to the West Bengal government on the plea of the Gorkhaland Territorial Administration (GTA) challenging refusal to transfer administrative powers to it. The court also sought the West Bengal government's response over non transfer of administrative powers to the GTA. The apex court in September last year agreed to examine GTA's plea challenging the state government's refusal to transfer administrative power and various subjects to it despite the tripartite agreement that was reached between West Bengal and the Union government in 2011. 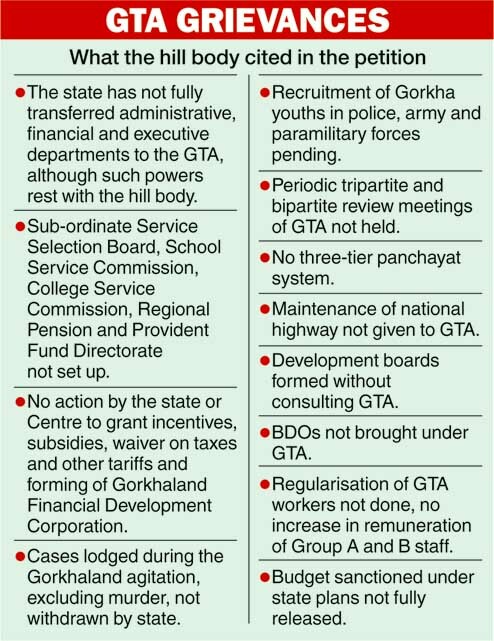 GTA member Binay Tamang had earlier claimed that the state government's decision was "impinging upon the fundamental rights of the Gorkha people living in the hill areas of the district of Darjeeling". The bench headed by the then Chief Justice TS Thakur asked the 2011 notification issued by the West Bengal government promising transfer of power in terms of a memorandum of agreement (MoU) to be presented before the court. However, the officials then had said that the petition alleging state government's refusal to transfer administrative power is misleading. "We are progressing with the matter as in a timely fashion. Of the 59 subjects, 55 have been handed over to GTA," said a senior home official. The Union government, the West Bengal government and the Gorkha Janmukti Morcha (GJM) signed a tripartite agreement on July 18, 2011 to create Gorkhaland Territorial Administration. The administration will have greater financial and administrative autonomy. 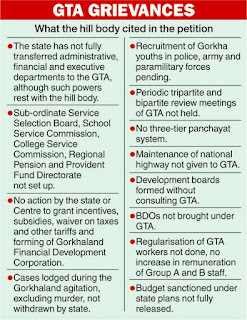 The tripartite pact gives Gorkhaland Territorial Administration powers to generate revenue. Elections to the GTA will be held within a few months and all parties will be free to participate in the electoral process. The GTA will have authority over civic bodies, departments of electricity and IT in the proposed Gorkhaland area. It will also be given power to control tea gardens and the crucial tea industry. The home and police departments will, however, stay with the state government. The state and the Centre will provide money to run the administration.